The firms that appear in the 2016 Global 100 are the largest 100 law firms in the world ranked by revenue. The headline numbers from this year’s Global 100 report do not make upbeat reading, even before the Brexit effect and resulting vote began to chill the market in Europe. While total revenue moved forward 3% to $95.99bn and lawyer headcount grew 6% to 122,945, the per lawyer and per equity partner metrics are flat: average revenue and profit per lawyer (RPL and PPL) are down 2% to $781,000 and $308,000 respectively, while average profit per equity partner (PEP) stood still at $1.6m. With income growth flattered by consolidation – primarily Dentons’ merger-mania and the digestion of Bingham McCutchen – the world’s 100 largest firms are not, as a breed, growing at all. A fêted global giant acquires a punchy mid-tier player to provide coverage in a key global region. Hopes are high. Yet just a few years later the combined firm is plagued by culture clashes, an identity crisis and damaging departures. Buyer’s remorse sets in and the ‘acquired’ firm longs for freedom or even just the good old days. 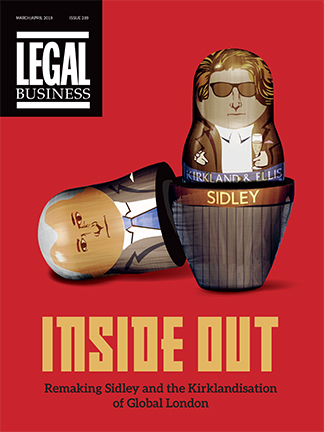 As we report this month in our cover feature on King & Wood Mallesons (KWM), the painful reality is that SJ Berwin has become, for the global legal market, the modern equivalent of Rogers & Wells, the troubled US acquisition that halted Clifford Chance (CC)’s once unstoppable momentum.